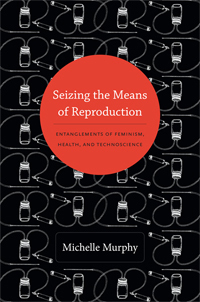 In Seizing the Means of Reproduction, Michelle Murphy’s initial focus on the alternative health practices developed by radical feminists in the United States during the 1970s and 1980s opens into a sophisticated analysis of the transnational entanglements of American empire, population control, neoliberalism, and late-twentieth-century feminisms. Murphy concentrates on the technoscientific means—the technologies, practices, protocols, and processes—developed by feminist health activists. She argues that by politicizing the technical details of reproductive health, alternative feminist practices aimed at empowering women were also integral to late-twentieth-century biopolitics. Murphy traces the transnational circulation of cheap, do-it-yourself health interventions, highlighting the uneasy links between economic logics, new forms of racialized governance, U.S. imperialism, family planning, and the rise of NGOs. In the twenty-first century, feminist health projects have followed complex and discomforting itineraries. The practices and ideologies of alternative health projects have found their way into World Bank guidelines, state policies, and commodified research. While the particular moment of U.S. feminism in the shadow of Cold War and postcolonialism has passed, its dynamics continue to inform the ways that health is governed and politicized today. Michelle Murphy is Associate Professor of Women & Gender Studies and of History at the University of Toronto. She is the author of the Sick Building Syndrome and the Problem of Uncertainty, also published by Duke University Press.